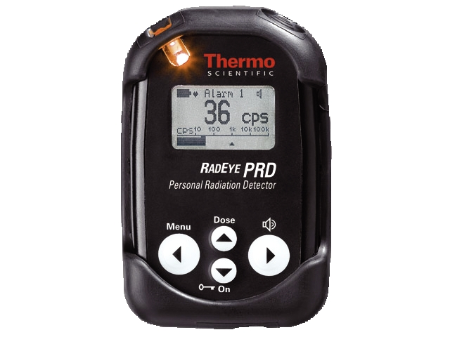 Detect and localize radiation sources generated by manmade devices such as nuclear weapons, improvised nuclear devices (INDs) or radiological dispersal devices (RDDs) with the Thermo Scientific™ RadEye™ PRD Personal Radiation Detector. The RadEye PRD detector provides border guards, customs agents, special forces and counter terrorism teams with high-performance detection for any scenario. The Thermo Scientific™ RadEye™ PRD-ER Personal Radiation Detector with extended range, is ideal for both interdiction and response. The RadEye PRD Detector is a high sensitivity gamma radiation detection and dose rate measurement tool for security forces, steel and recycling industry, and first responders seeling to detect and locate orphaned sources or problematic NORM related sources in scrap yards, border crossings and other public locations. 5000 to 10,000 times more sensitive than a typical electronic dosimeter; incorporates highly sensitive NaI(TI) scintillation detector with miniature photomultiplier for detection of very low radiation levels (emphasis on gamma emissions below 400KeV). Patented Natural Background Rejection (NBR) technology provides high sensitivity with high selectivity; eliminates nuisance alarming due to naturally recurring radiation sources (such as granite). Can be used as a search and survey tool. Can be used in a belt-loop holster for hands-free operation. Menu-driven with an intuitive, easy-to-use format. Low-power-technology components and fully automated self-checks result in minimum maintenance. Includes removable rubber sleeve for extra protection. Compliance: Designed to meet ANSI™ 42.33/1, 42.32 and IEC 62401. No mutual shielding of neighbored detectors. No transition range with annyong hysteresis effects. No high-activity source for function test of high dose rate detector required. Equipped with large clear graphic display and audible/visible/vibrating alarms; earphone-output for silent alarming. Detectors NaI(Tl)-detector with high-quality microphotomultiplier; software switch for R or Sv energy response and calibration. Energy Range 60keV to 1.3 MeV, excellent detection from 30keV. Count Rate For Cs-137 (662 kev): 1.5 cps/µR/h (150 cps/µSv/h); For Am-241 (60 kev): 30 cps/µR/h (3000 cps/nSv/h). Units cps, Sv/h, rem/h, R/h. Dimensions L x W x H: 1.25 x 2.4 x 3.78 in. (3.1 x 6.1 x 9.6cm).